Trojan asteroids are travel companions to planets as they orbit the sun, remaining near a stable point 60 degrees in front of or behind the planet. Because they constantly lead or follow in the same orbit, they never will collide with their companion planet. The term "Trojan asteroid" was established when it was decided to name Jupiter's companion asteroids after warriors of the Trojan war in Greek mythology. Six planets in our solar system are known to harbor Trojan asteroids—Jupiter, Neptune, Mars, Venus, Uranus and Earth. Although more than 6,000 Trojan asteroids are known to be orbiting along with Jupiter, scientists have discovered only one Earth Trojan to date: 2010 TK7, found by NASA's NEOWISE project in 2010. Scientists predict that there should be more Trojans orbiting Earth, but these asteroids are difficult to detect because they appear close to the sun from Earth's point of view. In mid-February 2017, however, the OSIRIS-REx spacecraft will be ideally positioned to undertake a survey of the stable point in front of Earth. Over 12 days, the OSIRIS-REx Earth-Trojan asteroid search will employ the spacecraft's MapCam imager to methodically scan the space where Earth Trojans are expected to exist. MapCam is part of the OSIRIS-REx Camera Suite, or OCAMS, which was designed and built by researchers at the UA's Lunar and Planetary Laboratory. Many of the campaign's observations will closely resemble MapCam's planned activities during its upcoming search for small rocks orbiting asteroid Bennu. While the likelihood of finding such small rocks around Bennu is low, the Trojan asteroid search serves as an early rehearsal for this critical safety check, as well as for the mission's primary science operations. 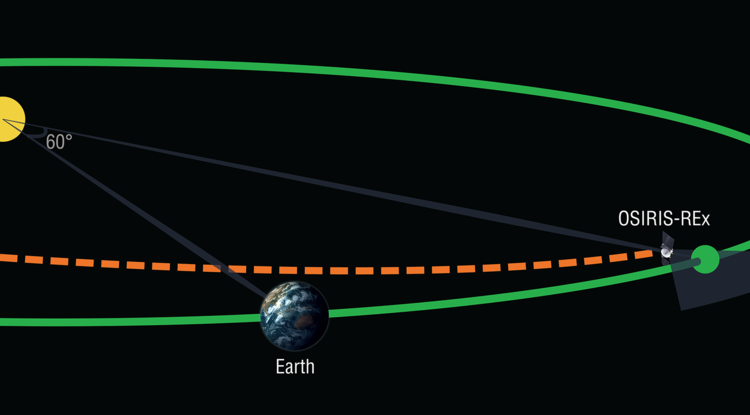 "The Earth-Trojan asteroid search provides a substantial advantage to the OSIRIS-REx mission," said Dante Lauretta, OSIRIS-REx principal investigator and professor of planetary science at the Lunar and Planetary Laboratory. "Not only do we have the opportunity to discover new members of an asteroid class, but more importantly, we are practicing critical mission operations in advance of our arrival at Bennu, which ultimately reduces mission risk." "...because they appear close to the sun from Earth's point of view."